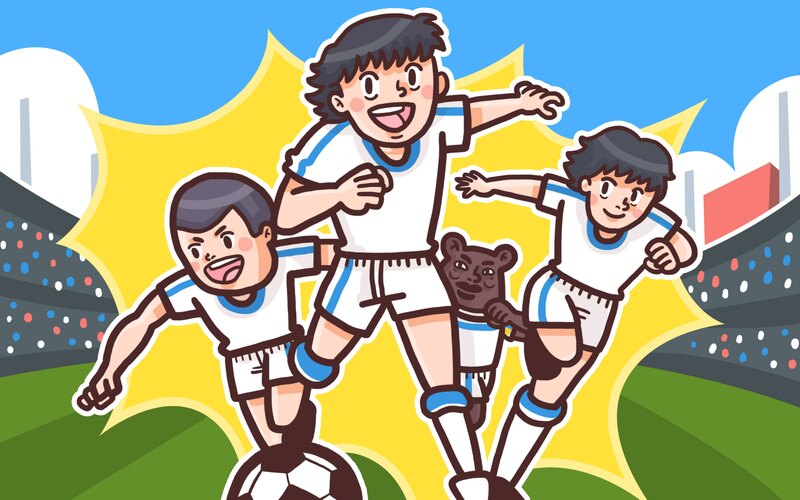 Captain Tsubasa and the Rise of Japanese Soccer Move over Baseball! I wasn’t a fan. I didn’t watch on television or have videos or anything. I don’t watch soccer now and when I retire that won’t change. I don’t really understand why people are soccer fans. I don’t like to watch any sport so I don’t understand what makes people do that. Hidetoshi Nakata, the first Japanese soccer player to find success in the major European leagues, refuses to watch soccer and is not a soccer fan. So what made him decide to play in the first place? “Nakata […] said that he read Tsubasa when he was young and that he had tried several of the skills featured in the manga, especially the overhead kick,” claimed Shisei Uchida from Weekly Shonen Jump, the longtime publisher of the world-famous soccer manga and anime Captain Tsubasa. 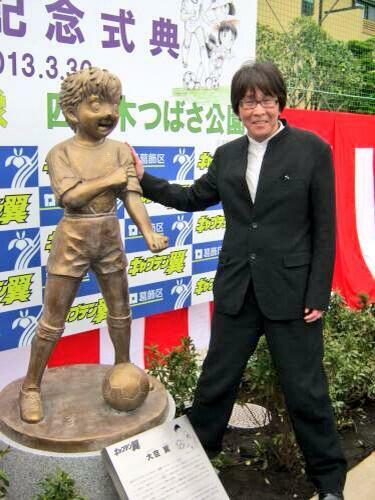 In 1978, manga artist Yoichi Takahashi became a soccer fan. “In my third year of high school, I saw the FIFA World Cup in Argentina on television and discovered the excitement of the sport,” Takahashi said in an interview with Nippon.com. “At the time, soccer was semi-professional in Japan and the teams were really poor,” he commented. “I learned that in Europe, soccer was far more popular than baseball, and the number of soccer players was much greater.” As Takahashi’s interest in soccer grew, he discovered a whole culture surrounding the sport in not only Europe, but in his new favorite leagues in Brazil. Takahashi was one of the early converts in what would become (partially through his influence) a new soccer nation in Japan. 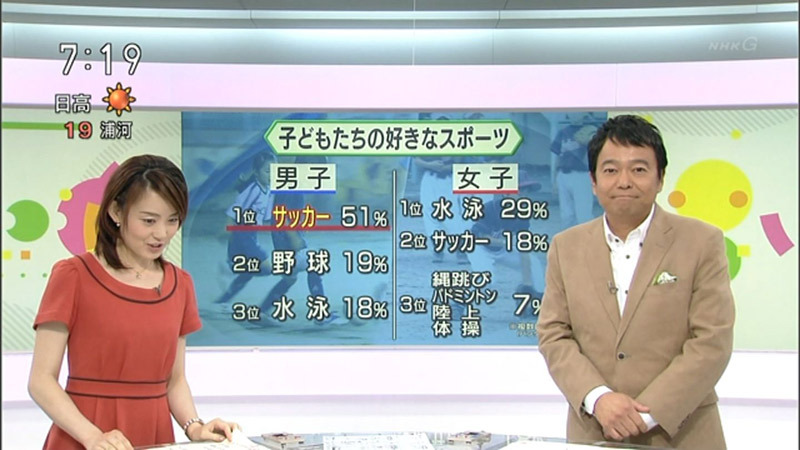 Baseball was the only nationally-popular team sport in Japan, and Takahashi’s favorite manga subject before his World Cup revelation. “During middle school I was into baseball manga, such as Dokaben and Captain, partly because I played baseball myself. Baseball was actually among the subjects I dealt with when I first started writing manga, but there were tons of baseball manga out there at the time. So I thought I might as well go with soccer, a mostly unexplored sport.” So in 1981, he created Captain Tsubasa, a story about an almost supernaturally talented young soccer player named Tsubasa Oozora who stars for his new high school, then the Brazilian leagues, then eventually for the world’s most famous soccer team, FC Barcelona. A Captain Tsubasa manga would run in the mega-popular Shonen Manga magazine Weekly Shonen Jump from 1981 to 1988, 1994-97, 2001-04, and 2010-12. Tsubasa was not the first soccer manga—The Red-Blooded Eleven and Shinji Mizushima’s Downtown Samurai took advantage of a brief blip of national interest in soccer after the Japanese national team won a bronze medal at the 1968 Olympics—but it was the first to achieve massive mainstream popularity and inspire future soccer superstars to take up the game. It’s difficult to overstate the reach and influence of Weekly Shonen Jump. Today, in America, the Sunday New York Times has a circulation of 2.3 million. The weekend Wall Street Journal reaches 2.4 million customers. The USA Today: 1.7 million. In 1982, when Tsubasa was in its early stages, Weekly Shonen Jump had a circulation of 2.55 million, toppling today’s American newspaper giants. At its peak in 1995, while running the Captain Tsubasa: World Youth manga (and little comic called Dragon Ball), Weekly Shonen Jump had a circulation of 6.53 million. Even now in 2013, with increased competition both within the magazine industry and from more and more video games and television, Weekly Shonen Jump has a circulation of 2.78 million. And Captain Tsubasa was one of their landmark comics. Its success spawned imitators like Offside and Whistle! and many of Japan’s first soccer success stories credited Tsubasa with their taking up the sport. Hidetoshi Nakata, the one quoted above who “doesn’t like to watch any sport” and “tried several of the skills from the Tsubasa manga” was the first Japanese soccer player to have top-tier success abroad, including winning the Italian championship with A.S. Roma in 2001 and playing in the English Premier League and UEFA Cup with the Bolton Wanderers. The outsized influence of Captain Tsubasa on Japanese soccer has had one major drawback: Tsubasa Oozora plays in a Maradona-inspired attacking midfield position, between the pure forwards/strikers and the defenders and defensive midfielders. Following his example, Japan has become a nation of midfielders, constantly struggling to find center-backs and strikers for both the J. League and the Japanese national team. Japan’s true superstars playing abroad—Keisuke Honda at CSKA Moscow (joining the even higher-profile AC Milan in January), Shinji Kagawa at Manchester United, Makoto Hasebe at FC Nurnberg—are all midfielders. Maya Yoshida is Japan’s most successful true defender ever, currently playing in the Premier League for Southampton, yet he too was a midfielder until J. League club Nagoya Grampus converted him to defender to fit him into their lineup. And none of the Japanese national team’s forwards actually play that position for their club: Hiroshi Kiyotake, Shinji Okazaki, Yoichiro Kakitani, and Takashi Inui all naturally play in a Tsubasa-style attacking midfield position. Directly or indirectly, Japan is now full of players who try to play the Tsubasa style, to the point that it makes it difficult to find other kinds of players. By 2002, when all the Tsubasa readers had grown up, Japan had a fully professional soccer league and had won a Korea/Japan joint bid to host a World Cup. Japan had never even qualified for a World Cup until 1998, but they defeated Russia and Tunisia before being eliminated by Turkey on home turf in Miyagi. The Japanese men’s national team had made extremely rapid progress from near non-existence to global contender status in only twenty years. The Japanese women’s national team has seen even greater success. 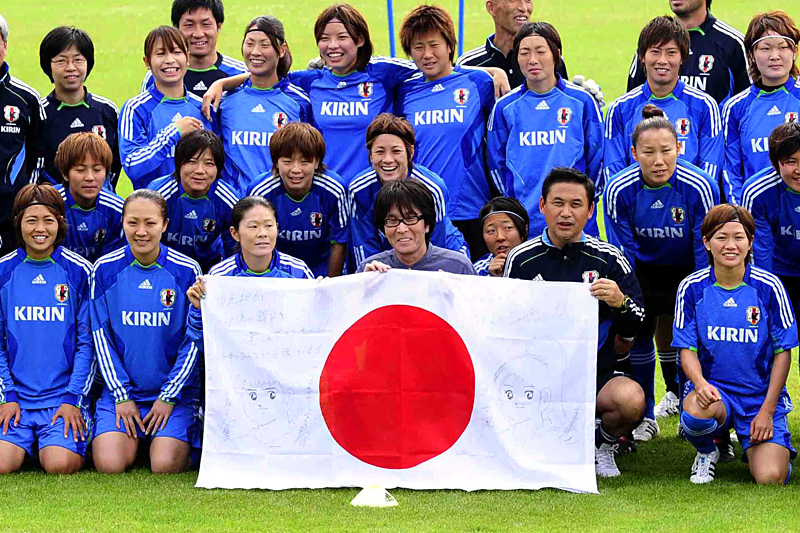 At the 2011 Women’s World Cup in Germany, Takahashi paid the team a visit before the Cup Final. Japan went on to beat the United States and claim their first World Cup trophy, led by Homare Sawa, yet another Tsubasa-style attacking midfielder wearing his number (10) and driving the offense with creative passes and long-distance shots. 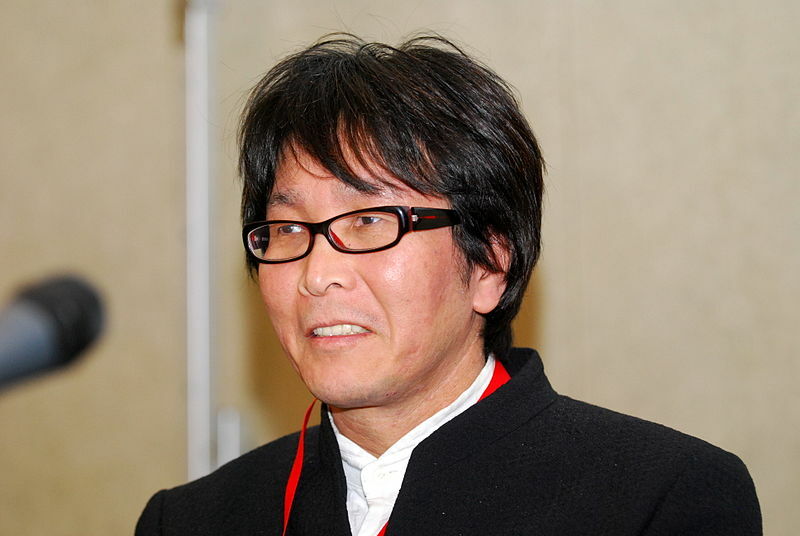 Takahashi was even called upon to support Tokyo’s bid for the 2016 Olympic Games, representing the country’s soccer legitimacy against Raul for Madrid and Pele for the eventually successful Rio de Janeiro bid. He drew Tsubasa and fellow main character Wakabayashi on the Tokyo 2016 flag flying in Copenhagen, where the host city was to be chosen. Tsubasa successfully interested a wave of Japanese children into soccer, so perhaps it was only natural that it would become even more popular in countries that were already sold on this whole “soccer” thing. The anime was translated and broadcast all over the world, in every language from Arabic to Tagalog. In the Middle East, viewers tuned in to Captain Majed. In South America, they watched Supercampeones. North American Tsubasa fans thought they were watching a show called Flash Kicker. 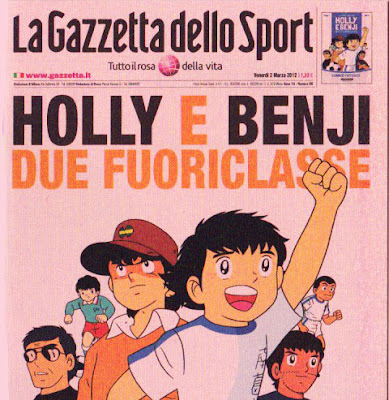 And in Europe, Tsubasa was renamed Oliver and the goalkeeper Wakabayashi was renamed Benji, so many Spanish and Italian soccer players grew up obsessed with a cartoon they called “Oliver and Benji.” It was this version of the show in particular which inspired many current-day stars to take up the sport.